High-quality 140 denier strong support (ca. 15-18 mm Hg) tights by Compressana. 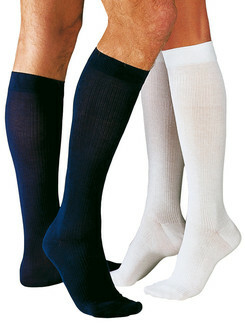 Compressana is specialized in manufacturing ideally fitting hosiery with support and compression functionalities. More and more people suffer from strained legs due to having to endure long periods of sitting or standing, leading to severe venous disorders if not taken care of. The compression classes range from light to very strong. However, Compressana makes sure the healthy leg effect is in line with an attractive look. Tights and knee high socks are available in sheer, semi-sheer and opaque as well as stockings with lovely lace tops. There is a variety of basic shades to choose from with trendy bright colours available.